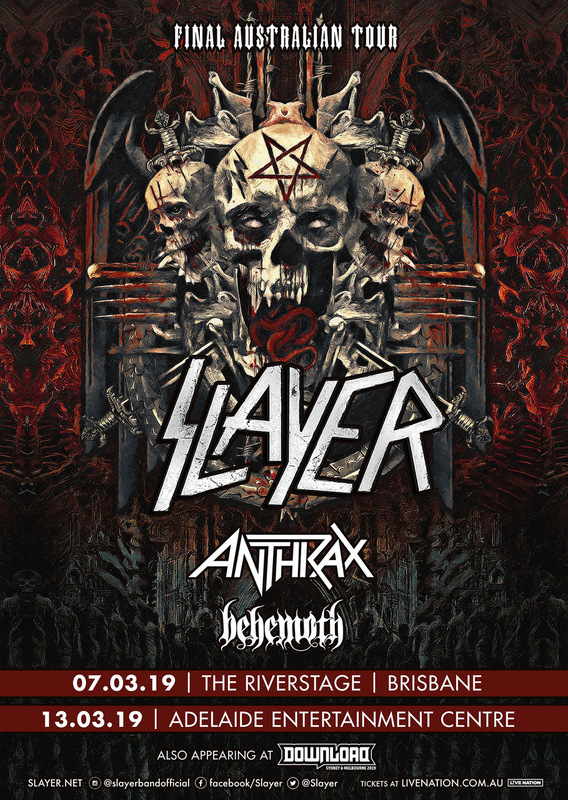 United by their appearance at Download 2019, two of thrash metal’s ‘Big Four’ Slayer and Anthrax are joined by the Polish dark lords Behemoth for two nights of absolute mayhem as they hit the unsuspecting folk of Brisbane at The Riverstage, and Adelaide’s AEC Arena this March. This will be the last opportunity for fans to see the legendary Slayer headlining in Australia, after 37 years of making metal history, with 12 studio releases and an array of Gold albums. This occasion also marks Anthrax’s return to Aussie soil for the first time since 2013. With over 10 million albums sold in a highly distinguished career, things (thankfully) don’t seem to be slowing down for the New York heavyweights. Completing the monster lineup, Behemoth will bring their brand of black metal after the recent release of I Loved You At Your Darkest. 27 years of darkness and these guys still have a lot to give. On sale at 11.00am Wednesday, 21st November 2018. My Live Nation members can be among the first to secure tickets during the pre-sale commencing at 10.00am Tuesday, 20th November. For complete tour and ticketing information, visit: livenation.com.au.